Horse head charm bracelet. 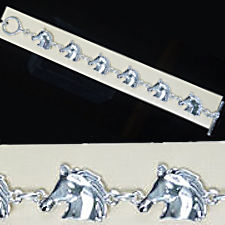 This bracelet is 7" (17.8 cm) long and features 6 horse head charms measuring 3/4" (1.9 cm) by 5/8" (1.6 cm). The bracelet closes with a toggle clasp. This product was added to our catalog on 01/14/2019.